Lawyers have learned something from working class politics. "It has to be a decisive action after preparations". It took long time for lawyers movement to understand the importance of Dharna and long march, and of decisive nature. Now they must be supported by whole heartedly. Let us have a Dharna till the restoration of judges and independent judiciary. All Roads must now lead to Shahrai Dastor Islamabad on 9 March 2009. The announcement of Dharna is one of the most important announcement in the history of Pakistan by a group of middle class, normally known to work for the interests of capitalist and feudal class. The move, if successful will be a milestone for a politics of resistence and extra parliamentary measures in favor of working class interests. Let's learn from some experiences of Dharnas in Pakistan. Let us leave aside for the moment the examples of Dharnas in other countries which is full of successes and lessons to learn. 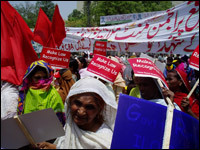 In October 2008, Malik Ajmal MPA from PMLQ and an owner of a textile mill in Faisalabad threatened the workers of dire consequences if they demanded a raise in wages. Workers defied as most of the workers of other factories had done. Malik Ajmal and his gangsters opened fire and injured over 6 workers. The workers of the other factories gathered and started a Gherao. Those who fired were inside the factory. However Malik Ajmal had fled from the scene. The workers in thousands wanted to burn the factory and the gangsters inside. The leadership of the workers arrived and decided not to burn anything but to continue the Gherao peacefully. They demanded the arrival of Punjab Labour Minister and arrest of Malik Ajmal. I arrived from Lahore to Faisalabad within three hours of the firing incident. After initial consultation with local labour leaders, we decided to keep the Gherao peaceful. Workers were angry but explained again and again that we will not burn the factory and will not throw stone. At the time, over 10,000 workers had gathered. The role of leadership in such crucial times is very important. They have to fight the injustice while being in control of the situation. Our power is in head counts and not in provocative angry behaviors. Finally, the minister arrived, police arrested the MPA and workers dispersed peacefully. We had the similar experiences in Okara while fighting for land rights at Military Farms with police and rangers. Women and youth played the leading role in this most successful movement. Our principles were simple and clear. "Once a road is blocked, we will not disperse until the demands are met. We will not leave it to next time". We were always peaceful but militant. We will never fire at police or rangers but will not leave the roads. We will always fight back whenever police used tear gas or lathe charge. We will disperse for a while to re gather. The 9 March Dharna call is a very serious but militant attempt by lawyers movement to challenge the high headedness of the feudal leadership of PPP. It is not just for the lawyers or judiciary, it is a working class issue. We appeal to all the trade unions, peasant organisations and social movements and organisations to side with the lawyers call on 9 March. We must mobilize in maximum numbers all our contacts with our full powers. 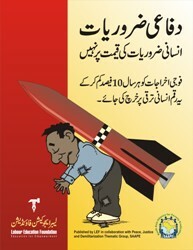 Zardari regime must learn to respect the will of the people. He has given a bad name to politics by not going along with the promise of restoration. Zardari, Rehman Malik, Farooq Naik and Sherry Rehman "The gang of four" must face the real power of people. The gang is not a product of mass politics. They believe in conspiracies, lies, frauds, loot and plunder and favors. They are accidental leaders. Let us discuss all aspects of this 9 March call. Let us discuss how to fight back if state forces are used to pre arrests and blockades of Islamabad. Let us discuss how to mobilize maximum numbers Let us have a target of one million on the march on 9 March. Let us make and contribute to the shining history of lawyers movement.